Biru is a new Japanese concept restaurant that incorporates fine dining together with the pleasures of braaing quality selections of seafood and red meat while also having the option of eating flavored broth from the hot pots. The trip to get there I must say was the least enjoyable moment of the experience, reason being that the restaurant is in a bit of a ‘dodgy’ area so to speak – basically behind the macDonald’s on Rivonia road. You then park, walk down a dark path where thankfully there is security to guide you to the building where you catch the elevator up three floors. Once at the reception, the usher seats you and your guest, and there begins the fun! You get to your table which has two stove tops – one to braai on and the other to cook/keep warm your ordered soup. The menu is quite overwhelming – way too many options. But luckily my girl came to the rescue and just handled business there. She ordered for starters: 1) wagyu beef tongue which was so thinly cut, it was basically non-existent. And 2) wagyu beef brisket which was there at least lol. 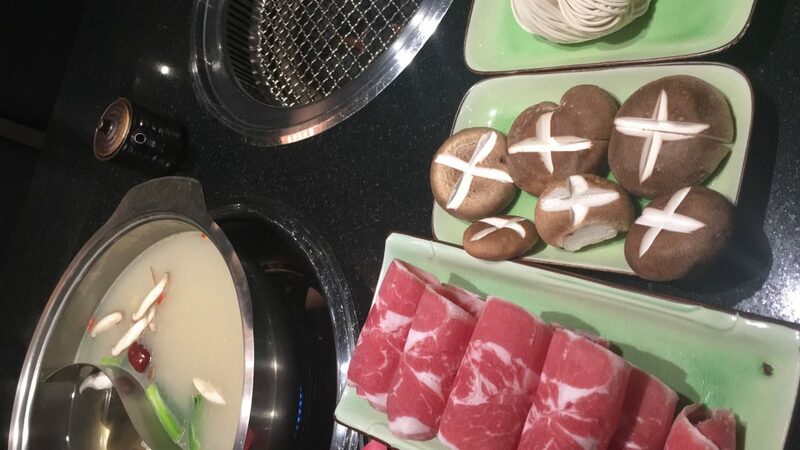 Following this we had the two-flavored hot pot (vegetarian and chilli bone broth) with lamb meat and shiitake mushrooms. The shiitake is an edible mushroom native to East Asia, which is cultivated and consumed in many Asian countries. It is considered a medicinal mushroom in some forms of traditional medicine. Wagyu is any of four Japanese breeds of beef cattle, the most desired of which is genetically predisposed to intense marbling and to producing a high percentage of oleaginous unsaturated fat. The meats came first, which we put on the gas stove to braai – basically turning them over every few minutes till they were crispy. The tongue we tried cooked two ways, firstly very lightly cooked – which made them very chewy. The second option was over cooking them which made them more to my liking. The broth then arrived in a silver pot which was separated in the middle. The waiters place this on the other stove where you are basically given the ordered meats and vegetables which for us was frozen lamb with the shitakki mushrooms and noodles. You then add the pieces into the broth and watch them cook for about 10 to 15 minutes while chatting and catching up on life. The resulting soups were delicious!! I am not really into chili stuff so the chili bone soup was killing my throat, so this is definitely not an option for next time. The restaurant offers really great service and in the event, that you don’t know what to order or hot to cook it – the waiters are there so that you don’t feel out of your depth. I definitely would recommend this spot as a 9/10 to anyone.